Hagar is darling. She has a sweet face, a sweet (if cautious) disposition, and a sweet fleece. She is part of a group of 2nd generation females from a reposession herd. Since we specialize in suris in our personal herd, we are parting with these huacaya girls are a very special price. 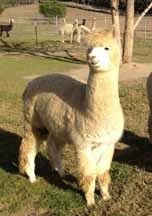 Bred females are $1200, maidens are $1000. If you are thinking of starting a herd of fiber-producing sweeties, this is a grand opportunity, and Hagar is a great way to start.